T7 RNA Polymerase catalyses the synthesis of RNA in the presence of double-stranded DNA containing a T7 promoter sequence. It is isolated from an E. coli transformed by a plasmid containing the T7 RNA Polymerase gene. 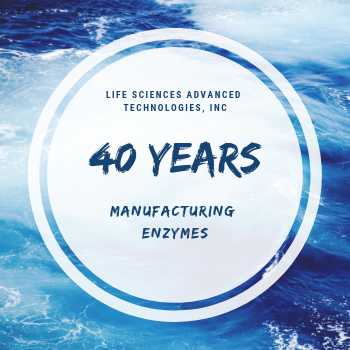 This enzyme is provided in trehalose-based storage buffer containing: 20 mM potassium phosphate pH 7.5, 100 mM NaCl, 1.0 mM EDTA, 10 mM DTT, 0.2% Triton X-100 and 50% glycerol. Alternatively, it is also provided in the same buffer containing 1.0 M trehalose instead of glycerol (suitable for lyophilization). Concentration 70,000 units/mL. 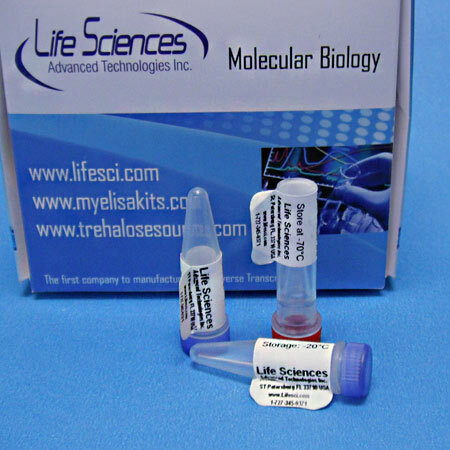 [3H]-UTP, 20 µg/mL non-linearized plasmid DNA, 50 µg/mL BSA. Dithiothreitol is required for T7 RNA Polymerase activity. This labile component of the reaction buffer may be restored by supplementing reactions with a final concentration of 10 mM DTT. Higher yields of RNA may be obtained by increasing the concentration of NTP’s to as much as 4 mM. Care must be taken that the total salt concentration in the reaction does not exceed 50mM, since this enzyme is sensitive to salt concentrations exceeding this amount. 1.) DNase Activity: One-half µg of Hae fragments of Phi X-174 DNA is incubated at 37ºC with 175 units of T7 RNA Polymerase for 3 hours, and then electrophoresed in a native agarose gel simultaneously with control positive DNase 1 reactions. No more than the equivalent of 1.25 X 10E-4 unit of DNase 1 is detected. 2.) Ribonuclease Activity: One microgram of an RNA Ladder is incubated for 2 hours with 280 units of T7 RNA Polymerase, and then electrophoresed in a native agarose gel simultaneously with control positive RNase 1A reactions. No more than the equivalent of 8.0 X 10E-8 unit of RNase 1A is detected. 3.) 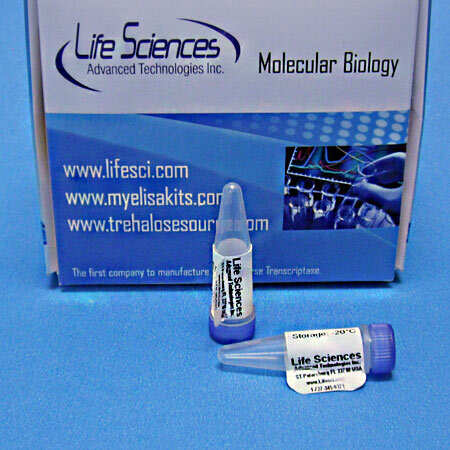 Specific Activity: The specific activity of the T7 RNA Polymerase is no less than 400,000 units per mg.